Honestly, I cannot recall exactly how this came to be. I've always liked owls though. They are perfect subjects for abstract interpretation. The way I do the ruffles on these bags is suppose to be like their feathers but I think that's obvious. 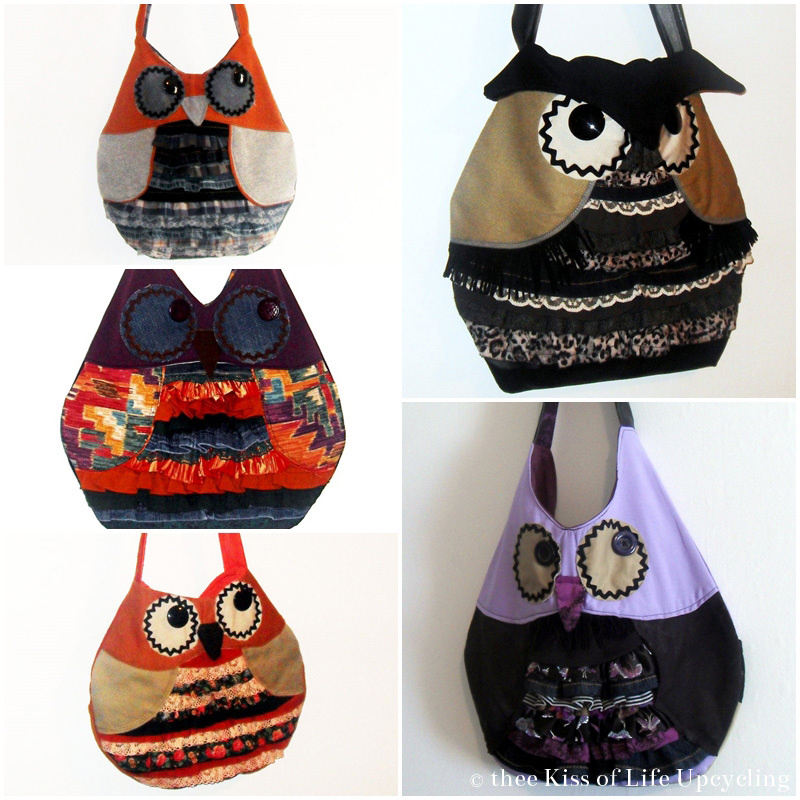 The first owl bag I made I listed and sold over on Artfire. 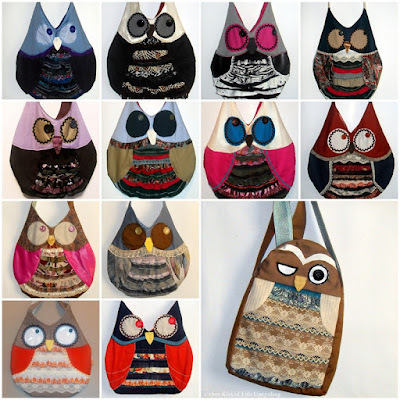 I did try once more to make a different kind of owl, where the flap was the top of the head and beak all in one. I wasn't convinced but it was cool to try out. I've never really used patterns. Using patterns is a more recent thing with me. I have realized how much time they save. Back then, every time I made an owl the measurements of the bag would be different. Some bags would come out so big and others way small. At first it was okay because I was trying to use materials without piecing them together. Some whole pieces were just smaller than others. One time I made this custom owl that had depth to it. Only made that design once too. As I'm going through my pictures of past owls I am reminded that I used to use Ric-rac trim around their eyes. I stopped doing that because I ran out but honestly I didn't want to keep adding it. It was a nice touch while it lasted. Eventually I did draft myself a pattern. I want them to be more uniform in size. It no longer matters if I have to piece together materials for their faces or the backs. I try to make those seams indiscreet not to take away from the rest of the design. That hasn't been too much of problem though. One problem I have tried my best to make better is the weight. The weight of the bags was fine at first, using mostly cottons and non-denim materials. After I started involving more denim, that's when it became an issue. If a bag starts heavy with nothing in it then it's only going to get heavier with your belongings in it. 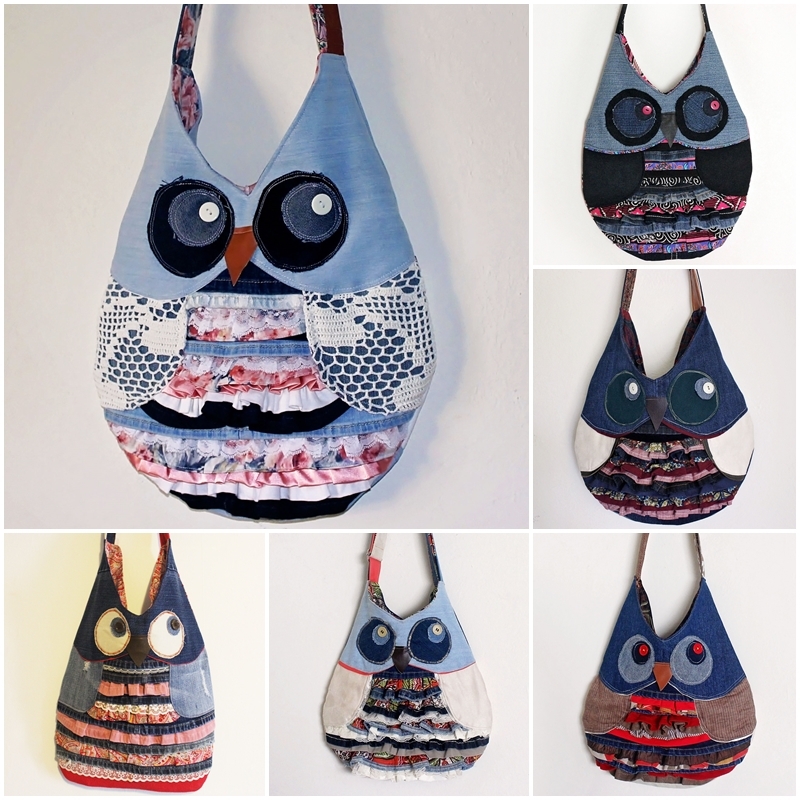 For example, the owl with the medium-weight crochet lace over lined denim wings, never again. Sure it looked pretty but I know that was added weight that could've been avoided. I wish I would've given that a lot more consideration since the very beginning. I like to think I've resolved that issue by being careful with the amount of denim and heavy materials I incorporate. 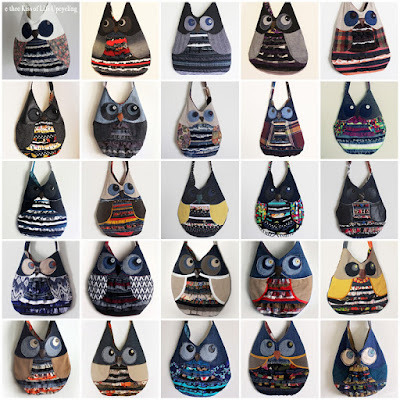 I know these bags are a novelty, boho whimsy, not everyone's cup of tea. They may not look like they are all that practical but I have always tried to make them as functional as possible, like by giving them a good amount of pockets. I love pockets. Also by having shoulder and cross body options. 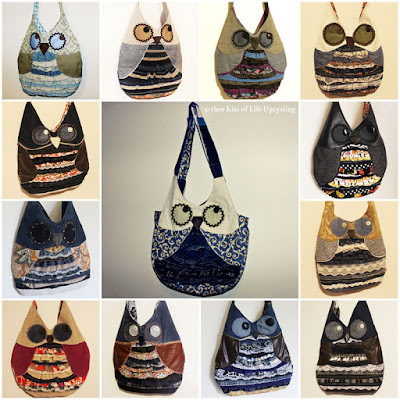 This goes for all bags I make, not just my owls. There has been trial and error but that's what keeps you progressing. A while ago I had someone tell me they were tired of my owls, they were "just saying". I wasn't quite sure how to take that. I'm well aware that if we never listen to feedback, we’ll never improve but what even was that? Well sorry, not sorry, I'm not tired yet. This isn't a trendy fad. It's like my whole mission statement being completely ignored. I make these bags as an on-going upcycling effort, not to mention artistic endeavor. 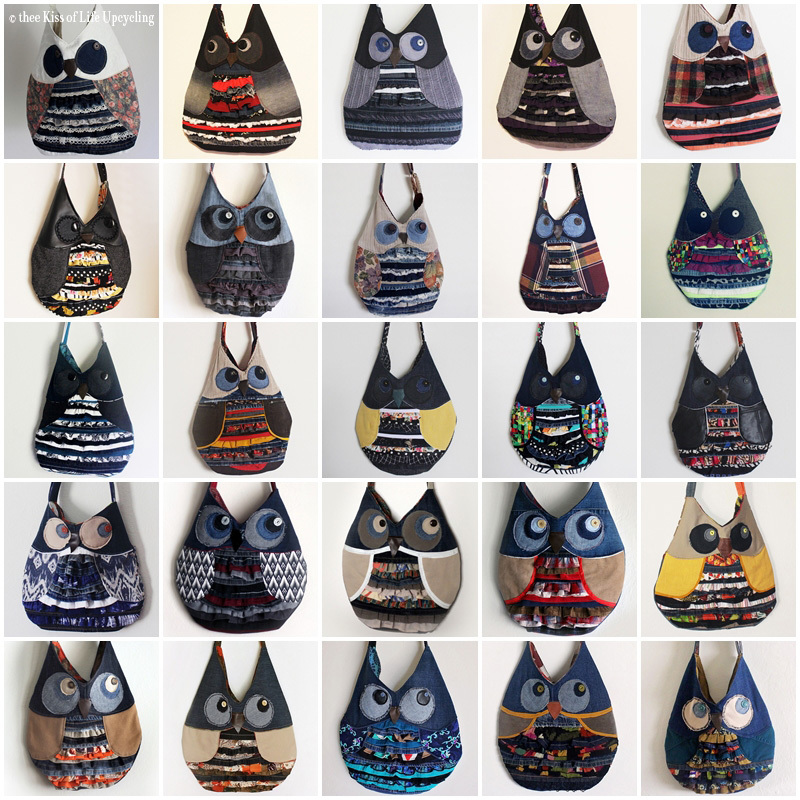 So as long as there is clothing to be upcycled, I will continue. Thank you so much for reading. 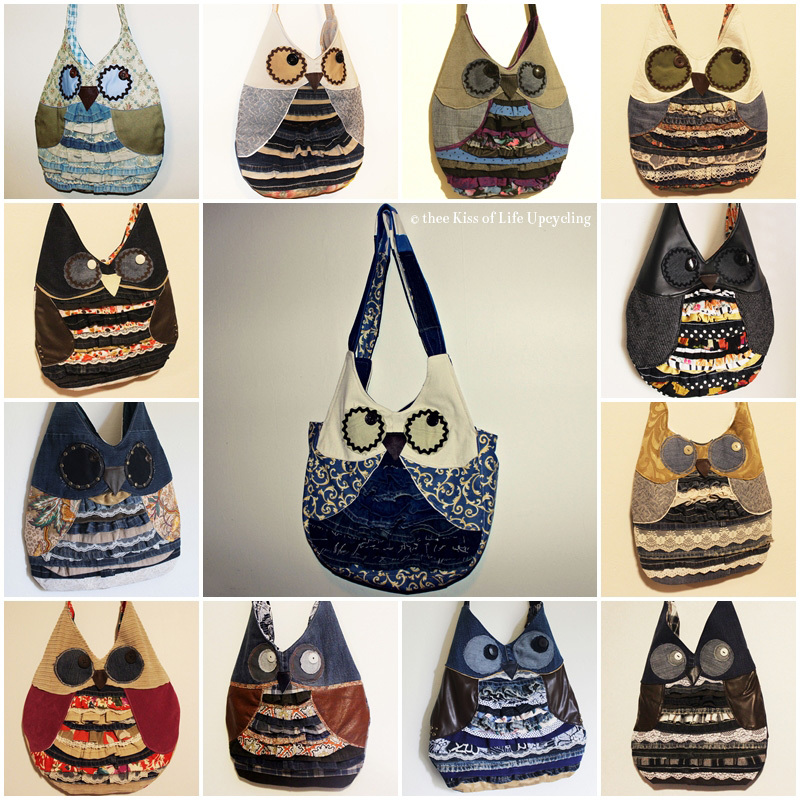 You can check out the owls I have in the shop ready to ship, here.